Friendly Ice Cream Corporation – Brett Malden aka "bmw"
When Friendly’s family restaurants needed to update their corporate site, we looked beyond a simple refresh and added new features and specs to push their numerous product and event promotions, better showcase their updated menu and connect the site traffic to various relevant social networks. 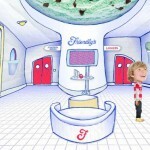 Friendly’s Ice Cream Company wanted to launch a dynamic website with interactive games and activities targeting children ages 6-12. The goal was to introduce this specific audience to the Friendly’s brand by immersing them into a “Friendly” virtual environment, engaging them with the complete Friendly’s product matrix interactively and then converting them into brand ambassadors.